Australia’s Renewable Energy Target looks likely to be weakened or even axed, with the Prime Minister saying the scheme needs to be reviewed because it is causing “pretty significant price pressure”. But does $15 a year sound like a “pretty significant” cost to you? According to the last national review of the Renewable Energy Target, $15 a year from now to 2031 is all that an average Australian household would save if we scrapped our national scheme to drive extra investment in renewable power. That review – by the independent Climate Change Authority, with economic modelling by global consultants Sinclair Knight Merz – was completed just over a year ago, in December 2012. Yet that very recent finding hasn’t stopped the federal government setting up a new Renewable Energy Target review, with Mr Abbott saying last week that the review would “consider the impact of the renewable energy target on power prices”. Already there have been front page reports of rifts within the government about the scheme’s future. Some, including Nationals Senator Ron Boswell, want to scrap the renewables target entirely, while others, including Environment Minister Greg Hunt, say they are “committed to keeping the RET because of the pre-election commitment and it’s been an effective way of reducing emissions”. So just what is the Renewable Energy Target? And what does it really cost an average Australian household – not just now, but in the future – according to the reviews and reports done on it before? The Renewable Energy Target (RET) is designed to encourage additional investment in renewable energy generation. It does this by requiring wholesale electricity consumers (mainly big power retailers) to purchase a certain percentage of renewable energy, which increases each year. This incurs a cost to retailers – companies like AGL and Origin – which is passed on to consumers through electricity bills. The current scheme is a more ambitious version of the scheme first set up by the Howard government in 2001. In 2009, the target was increased five-fold (under the Rudd government, with Coalition support) to mandate that 45,000 gigawatt hours of Australia’s electricity generation must come from renewable resources by 2020. 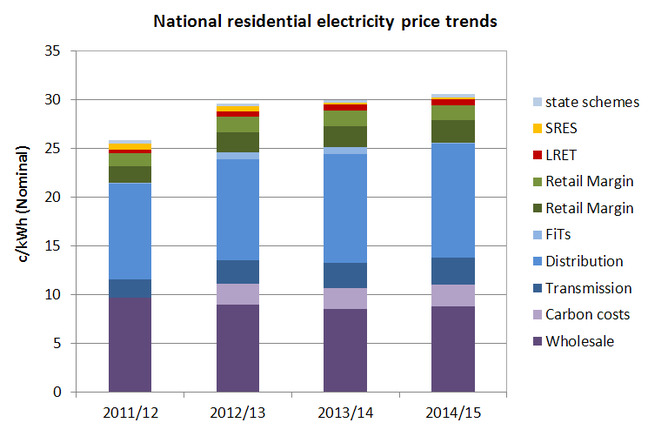 At the time the RET was legislated, this was projected to be the equivalent of 20% of total energy supplied in 2020. It wasn’t controversial at the time; in fact, then opposition MP Greg Hunt wrote an article that year, questioning why it was taking so long to introduce. What does the renewable target cost you? Currently, around 3-4% of your bill can be attributed to the Renewable Energy Target. For a typical residential consumer, that works out to be about $50-$70 per year, out of an average bill of about $1800-$2200. So in that sense, the Prime Minister is right about there being some additional cost. But let’s put that in perspective. As the graph below shows, the main reason for “pretty significant price pressure” on retail power prices is increasing network costs. According to the Australian Energy Market Commission, these have and will continue to dominate electricity price increases. You have to look hard to even see the costs associated with renewable energy. When you consider the way renewables interact with the wholesale electricity market, the overall cost is even less. Adding more renewable energy into the mix of our electricity supplies actually has the effect of lowering wholesale electricity prices. It may seem counter-intuitive at first, but it is simply the laws of supply and demand at work. If you increase supply and competition in a market, prices can be expected to fall. 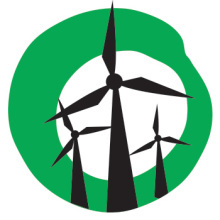 In the case of renewables, it is exacerbated by the low marginal cost of generation, and is known as the “merit order effect”. The merit order effect is often overlooked in discussions of renewable energy costs. If lower wholesale prices were passed through to consumers, the overall cost of the Renewable Energy Target scheme would be even lower. In fact, some energy users may be effectively overcompensated, and benefiting from this effect. Trade exposed industries (such as aluminium smelting) are exempt from paying 90% of the Renewable Energy Target costs, but may benefit from lower wholesale prices. Why not tinker with the target? In the few years since the Renewable Energy Target was set, demand for electricity has dropped, meaning the amount of power we’re likely to consume in 2020 has been revised significantly downwards. Under current arrangements, that means that the RET scheme would end up providing more than 20% of total power demand in 2020 – probably more like 26%. One option being pushed by Origin Energy is for a “25% by 2025” target. That might sound like an increase – but actually that would mean less renewable energy in 2025 than Australia is currently on track to build by 2020. On the weekend, Finance Minister Mathias Cormann was asked if the government planned to scrap or weaken the RET on Sky News. Senator Cormann said the government was looking for “sensible adjustments” to bring down power prices, since that would boost our international competitiveness while “helping families with cost of living pressures”. So let’s say Australia adjusted its current target to make sure we don’t build any more than 20% renewable energy by 2020. How much would it help families with cost of living pressures? The previous review for the federal government looked at just that option. And including the impacts on the wholesale market, the saving for an average Australian consumer was estimated to be between $0 and $10 per year. Going further, and scrapping the Renewable Energy Target entirely, would save just $15 per year. Yet the constant reviews and threat of further tinkering with the target is paralysing solar and wind energy projects worth up to $18 billion and putting thousands of jobs at risk. As of late last year, the solar PV industry alone employed about 13,600 people. Will we let history repeat? With such a relatively small impact on retail prices, why all the fuss about needing to change the target? The existing fossil fuel electricity generators have been hit hard by the impact renewables has had on the market: not only are they being displaced by renewables and selling less energy, they are receiving a lower wholesale price. primarily to alleviate the concerns of brown coal generators that the 10 per cent target would deliver too much renewable energy generation too quickly, which would reduce wholesale electricity prices and adversely affect existing generators. Will that happen all over again, this time at a national level? Perhaps. But this time, the renewable industry has grown and is planning to fight back with a marginal seats campaign and a public appeal to save the current Renewable Energy Target. With a bigger renewables industry, more jobs at stake and greater public awareness, maybe this time will be different.